The ability of the Armadillo Vault to stand strong without any glue is nothing less than an ingenious feat of engineering. 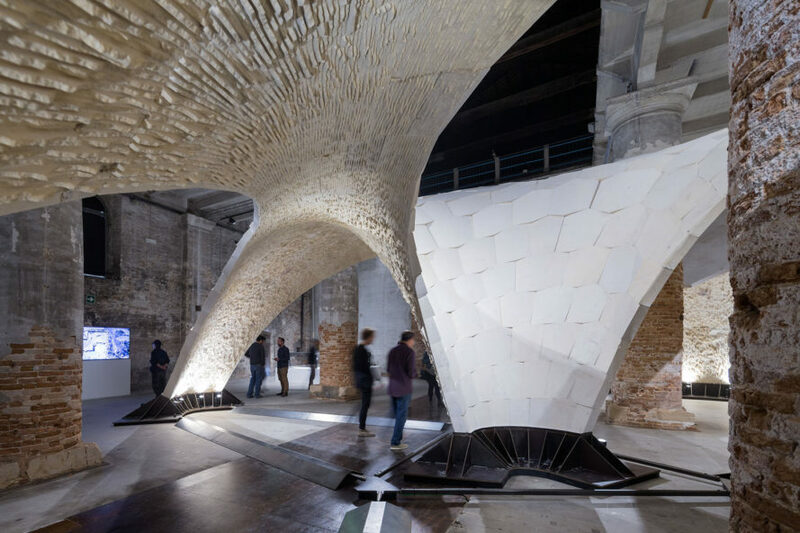 ETH Zurich designed the massive structure out of limestone slabs for the Venice Biennale 2016, showing how any material can become architecturally versatile with detailed design and a bit of finesse. The Armadillo Vault spans 16 meters (about 20 feet), yet some sections are only as thick as five centimeters. Proportionally, the structure is half the thickness of an eggshell and remarkably strong. Each slab of limestone was left unfinished on the bottom side for time’s sake, creating an exterior resembling an armadillo shell and an underbelly of textured stripes. The intentional choice of finicky limestone demonstrates how the “relationship between geometry and forces” can be achieved with precision and respect for the materials. Once the Venice Biennale ends, the Armadillo Vault will be moved to a different location. Described as an “intricate 3D puzzle” by the team, the structure can be disassembled and put back together while still maintaining its stability. ETH Zurich’s Block Research Group worked in collaboration with engineering firm Ochsendorf DeJong & Block and masonry specialist The Escobedo Group to bring the structure to life using expertly designed compression techniques. 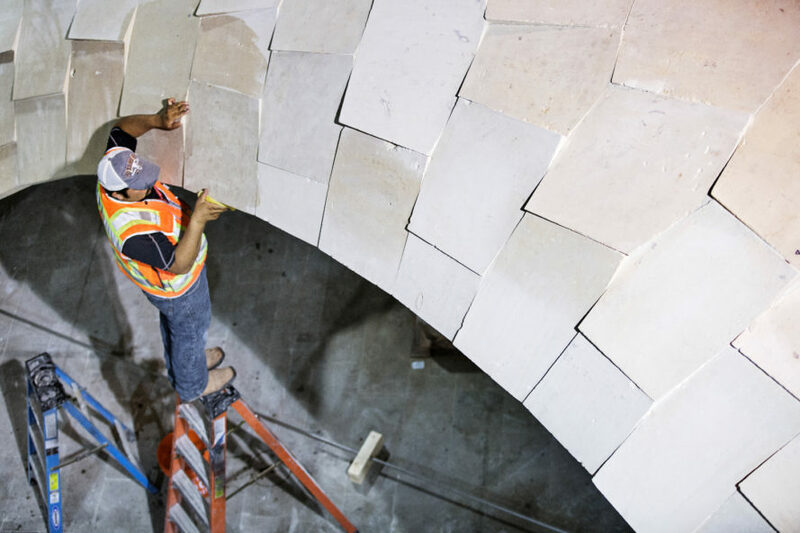 399 limestone slabs were brought together after mapping out the technique on RhinoVAULT, a design plugin licensed by the group. The Armadillo Vault spans 16 meters (about 20 feet), yet some sections are only as thick as five centimeters. Proportionally, the structure is half the thickness of an eggshell and remarkably strong. Each slab of limestone was left unfinished on the bottom side for time’s sake, creating an exterior resembling an armadillo shell and an underbelly of textured stripes. The intentional choice of often-finicky limestone demonstrates how the “relationship between geometry and forces” can be achieved with precision and respect for the materials. Once the Venice Biennale ends the Armadillo Vault will be moved to a different location. Described as an “intricate 3D puzzle” by the team, the structure can be disassembled and put back together while still maintaining its stability.